Adam Ferguson, sometimes known as Ferguson of Raith (June 20, 1723 (O.S.) - February 22, 1816) was a philosopher and historian in the Scottish Enlightenment. 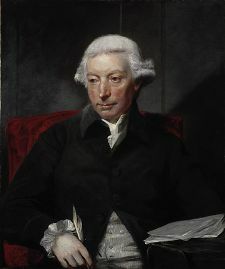 Most well known for his association with David Hume and Adam Smith, he contributed a social and political perspective on the development of philosophy in the Scottish Enlightenment. His most well known work is An Essay on the History of Civil Society in which he explores the development of civil society with a critical perspective. Born at Logierait in Perthshire, Scotland, he received his education at Perth grammar school and at the University of St Andrews. In 1745, owing to his knowledge of Gaelic, he gained appointment as deputy chaplain of the 43rd (afterwards the 42nd) regiment, and became its principal chaplain in 1746. He continued his attachment to the regiment till 1754, and left the clergy and resolved to devote himself to literary pursuits. After residing in Leipzig for a time, he returned to Edinburgh where in January 1757, he succeeded David Hume as the librarian to the Faculty of Advocates, but soon relinquished this office on becoming tutor in the family of the Earl of Bute. In 1759, Ferguson became professor of natural philosophy in the University of Edinburgh, and in 1764 transferred to the chair of "pneumatics" (mental philosophy) "and moral philosophy." In 1767, against David Hume's advice, he published his Essay on the History of Civil Society, which was well received and translated into several European languages. In the mid 1770s, he traveled again to the Continent and met Voltaire. In 1776, appeared his (anonymous) pamphlet on the American Revolution in opposition to Dr Richard Price's Observations on the Nature of Civil Liberty, in which he sympathized with the views of the British legislature. In 1778, Ferguson was appointed secretary to the Carlisle commission, which endeavored, but without success, to negotiate an arrangement with the revolted colonies. In 1783, appeared his History of the Progress and Termination of the Roman Republic; it became very popular, and went through several editions. Ferguson believed that the history of the Romans during the period of their greatness formed a practical illustration of those ethical and political doctrines which he studied at length. The history reads well and impartially, and displays a conscientious use of sources. The influence of the author's military experience shows itself in certain portions of the narrative. Tired of teaching, he resigned his professorship in 1785, and devoted himself to the revision of his lectures, which he published (1792) under the title of Principles of Moral and Political Science. In his seventieth year, Ferguson, intending to prepare a new edition of the history, visited Italy and some of the principal cities of Europe, where he was received with honor by academic societies. From 1795, he resided successively at the old castle of Neidpath near Peebles, at Hallyards on Manor Water and at St Andrews, where he died on February 22, 1816. In his ethical system Ferguson treats man as a social being, illustrating his doctrines by political examples. In contrast to the way Hobbes and Rousseau examine man in the state of nature, Ferguson asserts his position that man has always existed in society and therefore must be examined on the basis of being a social being. For Ferguson, the state of nature is that of man existing in a society, and not the unnatural conditions outside of society under which philosophers imagine an individual to exist in. In his most famous work, An Essay on the History of Civil Society written in 1767, he proceeds to cautiously examine the progress of civilization and takes a critical position towards whether or not the state of being actually improved over time given the negative effects of the current state of modern society. For example, given the commercial state he finds man to be reduced to viewing others in terms of his own profit, and compares this with situations lacking in external conveniences that deepen the bonds of human relationship. This entry updated from the 1911 Encyclopedia Britannica. This page was last modified on 31 January 2019, at 17:43.